Life has a funny way of catching your attention through what it throws at you and on this note have you ever wondered what other people go through while you are complaining about your own troubles? My goodness I have learned so much through the stories that we have featured in this issue, if you’ve never been molested, you’ve never seen the inside of a prison cell, thank the Lord and thank Him every day. There is a reason why we have called this issue THE ACHIEVERS issue, the incredible people we’ve shed light on will leave an impact like none before. The spotlight belongs to Mya Auguste and Diamos Demerritt , both shared their incredible stories with us with the hopes that they can tell the world about where they come from and where they are trying to go. We commend them in their endeavors and wish nothing but success for their paths. On a lighter note Josh Byer and Stephen Wilson from Canada are 2 incredible visual artists that are leaving their mark in the world of art. We’ve been privilege to be able to feature them all while introducing our brand new writer Laura Shirk. 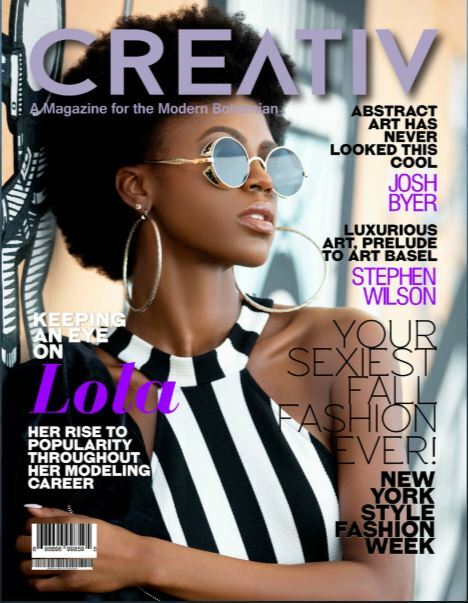 An issue filled with inspirational stories such as how Lola Chel, our cover photographed by our special guest photographer Joe Wesley, created her fame through social media while building her modeling career. Not to mention that our writers never disappoint each columnist brought something to the table that all of us can learn from. Another one for the books, we can’t thank you enough, our contributors, photographer, artists and writers for making #28 one of my favorite issues.